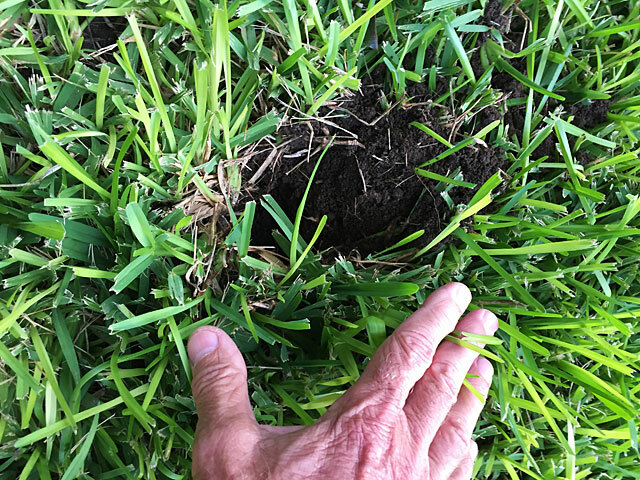 Lately, I've seen a lot of discussion on various local social media about folks who are having issues with critters tearing up their lawns and/or living where they shouldn't be living (e.g. skunks declaring a homestead under a back yard deck). These discussions often contain a lot of good advice, as well as some that's ineffective (in my experience) and other that's just wrong. The real problem is that, as far as I can tell, there's not a single repository for advice backed up by local on-the-ground experience, hence this post. 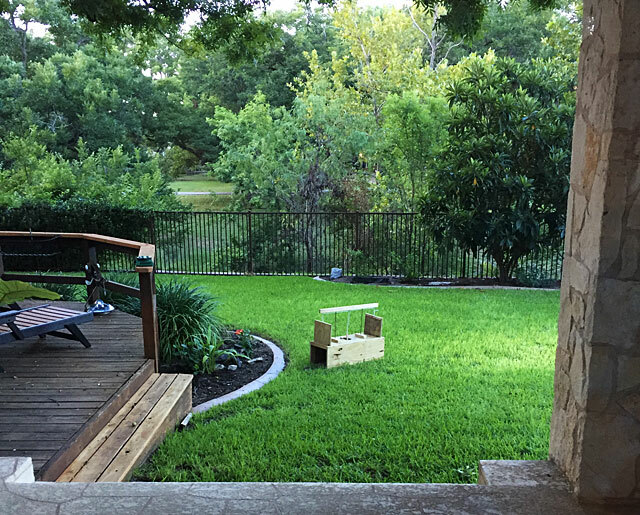 Google being the good servant it is, I trust that someone searching for trapping tips in the Texas Hill Country will find this article and try out some of the things I've learned since moving here. First, I probably should establish my bona fides as a trapper, although if you're a regular Gazette reader you've seen this many times before and can skip the next paragraph. Before moving here in the late summer of 2017, I had never caught anything bigger than a lizard, nor had I any reason to do otherwise. But we moved into a house that backed up to a creek and was surrounded by a golf course and large vacant lots and wooded areas. We immediately were confronted with a seemingly endless parade of varmints dedicated to the proposition that our lawn was the animal kingdom's equivalent of a Golden Corral. Also, there was this. In case my icons aren't intuitive, that's 17 raccoons, 24 armadillos, 7 possums, 4 skunks, and two house cats...more than 50 animals in all. So, perhaps I've gained some experience you'll find useful. Learn the Law. The Texas Parks & Wildlife Department (TPWD) is the state agency that regulates, among other things, "fur-bearing animal" trapping and hunting. The definition of "fur-bearing animal" includes the most commonly trapped animals in the Hill Country: raccoons, skunks, and possums (note that armadillos are not included). If any of these species are damaging your property, they fall into the category of "nuisance fur-bearing animals" and may be lawfully trapped by the property owner without any license or restriction. However -- and this is a big one -- trapped animals cannot be relocated to someone else's property without that property owner's permission. Visit TPWD's website to familiarize yourself with the relevant regulations. Identify your culprits. A lot of different animals live around here, and most of them are diggers or can otherwise damage your property. Squirrels dig tiny holes, but generally in flower beds or pots. Skunks dig holes, but not many and not too deep. Raccoons are worse than skunks about digging, but armadillos will make a literal minefield out of your yard, searching for grubs and worms. You need to figure out what's doing the damage in order to know what steps to take to mitigate it. Invest in a good game camera (I use a Moultrie) and set it out overnight near where you've spotted evidence of animal activity. Not only will you be able to know for sure what you're dealing with, you might also have some interesting surprises. Get the right trap for the job. 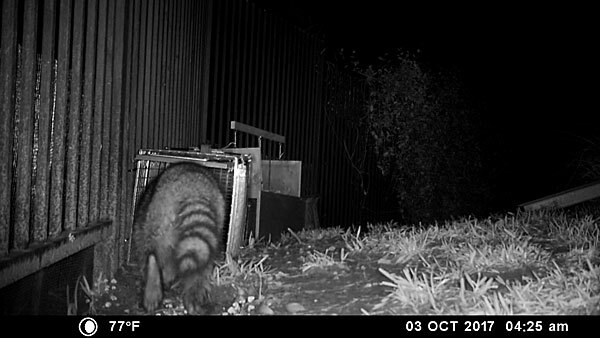 An effective armadillo trap probably won't work for a raccoon or skunk, and vice versa. For armadillos, I highly recommend this scented trap. Armadillos are creatures of habit and will often follow the same trail multiple nights in a row. Set this trap at night somewhere along where you first found the damage, and chances are you'll find an armadillo in it the next morning. It doesn't need to be baited; the scent (don't ask) embedded in the wood lures them in. They lumber blindly into the trap, hit the length of wood hanging down in the middle, and both ends of the trap drop down. The armadillo will bang around inside for a while, and then settle down and go to sleep. If you place a raccoon trap in your yard, make sure you place it on something they can't dig through -- like a thick doormat -- and stake it to the ground. I use bungee cords front and back attached to tent stakes embedded in the ground (make sure the cords don't interfere with the trap mechanism). 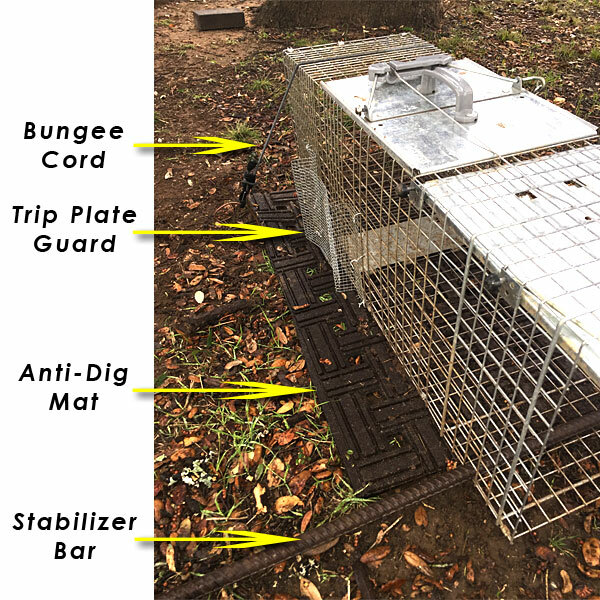 These are critical steps because they WILL attempt to dig their way through the floor of the trap and they WILL absolutely destroy the grass beneath the cage in the process. Raccoons are very active prisoners and they are able to roll a trap if it's not tied down and sometimes escape in the process. 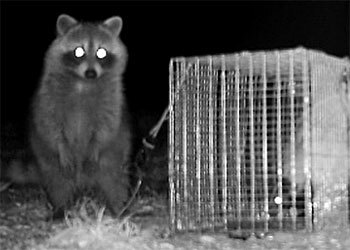 Raccoons are also inventive little thieves, so your bait should be placed as far back in the trap as possible to increase the likelihood that they'll step on the trip plate instead of reaching over it and absconding with a full can of delicious sardines. At some point, you may also discover that they've figured out a way to reach through the sides of the trap and pull out the bait a little at a time. I eventually customized my trap with wire mesh tied to the sides and end of the trap closest to the bait to prevent this behavior. Release responsibly. First, never set a trap if you won't be able to check it within the next twelve hours. It's inhumane to leave an animal in a trap for an extended period of time (and, yeah, I realize that some of you are simply going to exterminate what you trap, and that's certainly your prerogative, but while they're alive, be nice). Second, abide by the TPWD's regulations for releasing your animals, something that I confess I haven't always done due to the difficulty of tracking down property owners in undeveloped areas. Your best bet, if you live within city limits, is to call your local Animal Services department and have them deal with the trapped animal. This is especially true if you've trapped a skunk and don't want to simply release it (which, by the way, can be done safely if you're careful), or if the animal is behaving erratically, evidence that it may be rabid. I would also recommend getting Animal Services involved if you trap a fox...which is unlikely in my experience, but not impossible. I hope these tips are useful for ridding yourself of these kinds of critters. If, however, you're dealing with something like a black mamba or a 1,000-pound feral hog or a man-eating Bengal tiger...well, good luck with that, and let us know how that turns out. 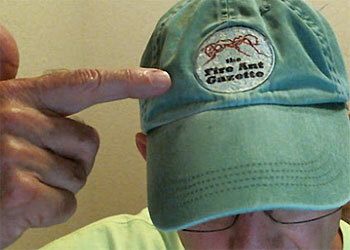 It's been a quiet couple of weeks at Casa de Fire Ant, at least from a trapping perspective. 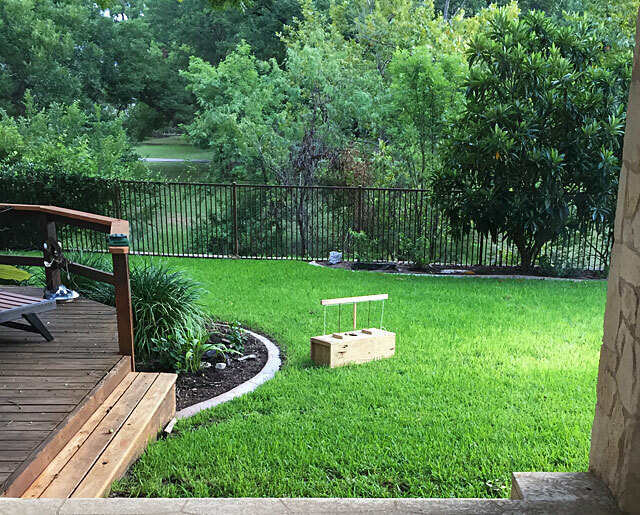 I haven't bothered to bait the raccoon trap for a variety of reasons -- laziness being at the top of the list -- although the armadillo trap has been armed and routinely ignored. 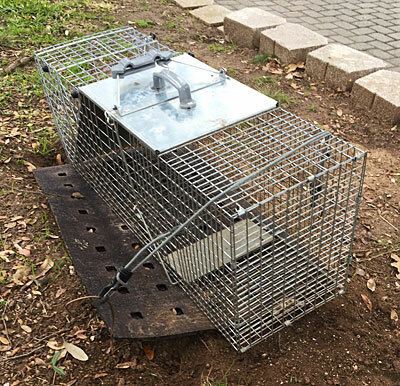 I assume that either (1) the armadillos have evolved intellectually to the point where they recognize and avoid the danger, or (b) the trap has lost its scent. I'm going with (b) because the alternative is too scary to contemplate. Alert Gazette readers will recall that I recently expressed a bit of frustration at what I believed to be theft by fox. I didn't have conclusive proof that I was being flimflammed by a fox, but the circumstantial evidence was powerful. I decided to risk another 88¢ can of sardines (the money is beginning to add up, folks; I'm thinking about starting a GoFundMe account to defray trapping expenses) as bait. I slid it into the trap around 10:00 last night and set the game camera on the ground a few feet away. When I checked the trap this morning, the bait was gone and the trap was unsprung and empty. However, the game cam was finally able to record the canine caper, and here's the proof. It may not be obvious from the video, but the fox actually steps on the trip plate. However, it appears that its weight is on the other forefoot and so the plate doesn't spring the trap door. That's fine with me; I don't really want to trap a fox. On the other hand, I also don't want them grabbing all the bait intended for raccoons. If you're wondering what it appears to be eating just before entering the trap, I pour the juice from the sardine can onto the ground just outside the entrance as a way to entice animals to enter. Gray foxes are pretty common around our neighborhood. On one occasion, as we drove into the neighborhood at night, we spotted three of them within fifty yards of each other. I don't know if the group is a family unit, or if there's just good hunting in the vicinity. Some people incorrectly identify gray foxes as red foxes, presumably because the former do have some red fur on their chests and underbellies. But the two don't really look that much alike, and aren't even in the same genus. We may indeed have red fox in our area, but I've never seen one. Another difference between the two species is that gray foxes are good climbers while the red species are not. Alert Gazette readers will recall this video of two (2!) gray foxes in our Midland back yard a couple of years ago. As you can see, they're quite adept at climbing trees and fences. I actually have a photo of a gray fox reclining on top of our roof, watching the world go by. In my role as a wannabe trapper I've grown accustomed to being outsmarted by raccoons, who have frequently escaped with the bait without being captured. However, I'm now being outfoxed by an actual fox. I didn't catch footage of the sardine abscondishment, but the tin was missing in another video captured shortly after this one. We've seen foxes hunting in our neighborhood almost every night (and occasionally during the day), and I've got other videos of them sniffing around the trap, but this is the first time I've seen one enter the trap. This one was a lot more cautious than the animation indicates; the realtime footage was 30 seconds. So, as if I didn't have enough challenges, I now have to figure out how to keep the bait safe from an animal that's long to grab the sardines without stepping on the trip plate. I do have a glimmer of a possible inkling leading to the beginning of a potential partial solution, but it involves power tools, MIG welders, and sorcery. In other words...this should be fun! With apologies to Mr. Henley, who likely didn't anticipate his lyrics would apply to raccoons, this seems to be exactly what I'm doing lately with my trapping efforts. 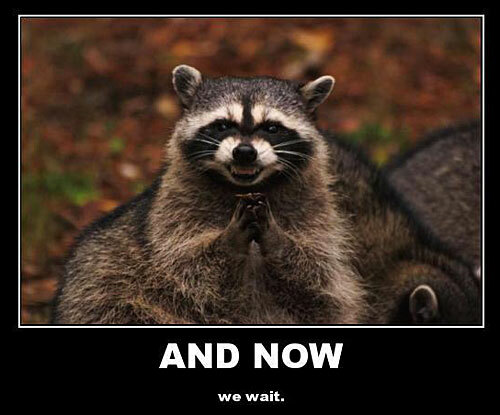 My wife thinks my motto should now be "Making Smarter Raccoons." I wouldn't disagree. We're in a sort of arms race, the neighborhood raccoons and I. Every time I concoct a strategy to trap them, they create a countermeasure that defeats it. It's simultaneously humbling and -- I confess -- a bit amusing. If this was a TV game show -- say, Are You Smarter Than a Varmint -- I'd be exiting before the first commercial break. I assumed the culprit was of a raccoonish persuasion, and the game camera footage proved my assumption. Shortly after baiting the trap, a raccoon appeared and got to work hacking my system. Raccoons wear masks for good reason; they're thieves, and quite good at their thievery. I refused to admit defeat, especially with the reputation of the entire human race riding on my efforts. Darn it, I AM smarter than a large rodent with a walnut-sized brain and goofy tail. Since the raccoons had obviously clued into the fact that they could dig under the trap to get the sardines, my own walnut-sized brain came up with the brilliant idea of sinking a fence into the ground around the cage. I did that, and reset the trap. The following morning, the results were the same: no raccoon; no sardines; no human superiority. Some people modify cars, some modify guns. Me? I'm into trap mods. My countermeasure is simple: I bent some screen mesh into a sort of shield and wired it in place so that a raccoon's reach couldn't get to the trip plate. Note that the shield couldn't just be a patch wired tight against the cage, as that would interfere with the trap's mechanism. Note to Havahart®: I'm happy to license this design improvement for a modest fee, say, sardines for life...? I also abandoned the idea of placing the bait under the trap as the raccoons have definitely learned to dig underneath it to get to them. I'll take my chances with them trying to grab the sardines inside the cage without tripping the trap. So, did my awesome trap mods pay off, or did I simply extend the hours of the Fire Ant Raccoon Evening Buffet? Here's the video answer, showing the previous night's failure followed by last night's...well, you'll have to watch it to find out. For now, advantage: humans. We'll see how long that lasts. By the way, I did realize last night that the description of the trap as a "humane raccoon trap" is indeed appropriate for one reason I hadn't thought about. The design ensures that the trapped animal is protected from rain and snow by providing a solid roof and wall at one end of the trap. The raccoon I released this morning was extremely annoyed, but at least it wasn't soaked by the overnight drizzle. Another day...another skunk. This time, with 100% more me. 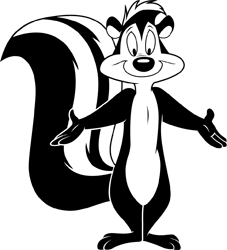 I woke up around 4:00 a.m. a few days ago (hold your snark; you'll be old someday, too), and detected the unmistakable odor of skunk. I found this a bit unsettling, but not enough to get out of bed to investigate. I rolled over and went back to sleep. A few hours later, I opened the garage door to check the trap, although I was pretty sure I knew what Id find. Sure enough, yet another skunk had checked into Citter Inn. As with the preceding two, I decided to record the release, and that's documented in the video below. While only you can decide whether it's worth spending 4 minutes and 6 seconds (plus load time) of your life watching this video (the TL:DW version is that I didn't get sprayed), I hope you will for a few reasons. First, this is a really pretty skunk. I'm not sure who represents the standard for human beauty nowadays -- for women, perhaps it's one of these; for guys...well, you're on your own there -- but let's say this critter is the Scarlett Johansson of the skunk world. Second, toward the end of the video you'll see some interaction between different species as recorded by my game camera, as well as the evidence of one whose affinity for and effort to acquire sardines was unparalleled. But, really, the most important reason is that I'd like to have your feedback about something. Rather than use captions to describe what's going on in the video, I took a shot at doing a voiceover narration. I'd be really interested to know whether you have a preference about captions vs. narration (or would BOTH be preferable?). I'd also welcome feedback about the quality of the audio, although that's less important. I recognize that my recording environment is less than ideal, particularly since we've cleared the shelves and walls of all content in preparation for remodeling. The sound is pretty echo-y as a result. Also, the webcam microphone is not exactly professional quality. I did try some pretty high-end Bose headphones as an external mic, but the results were actually less pleasing than the webcam, which I thought was strange. Anyway, here's how much I'd like your feedback: I've actually reinstated the comments section on the Gazette. It's been years since I've allowed comments on any posts because of the overwhelming volume of spam I had to deal with (you can ask any blogger and they'll tell you the same thing...it's ridiculous). But I'm willing to put up with it in order to see some legitimate feedback. So, feel free to let me know what you think...and thanks in advance! Without further ado...allow me to present Scarle...uh...another skunk. Alert Gazette readers - and, really, aren't you all? - will recall that I successfully, if foolishly, released a trapped skunk a couple of days ago without incident other than an elevated heart rate. I decided to give the trap a night off, but re-baited and re-armed it last night. I figured that a trapped skunk would have learned its lesson and would be focused on less confining dining opportunities. As with so many things in life lately, I was wrong. It's Biblical: as a dog returns to its vomit, so a skunk does to its sardines (Proverbs 26:11, ORGV [Old Retired Guy Version]). 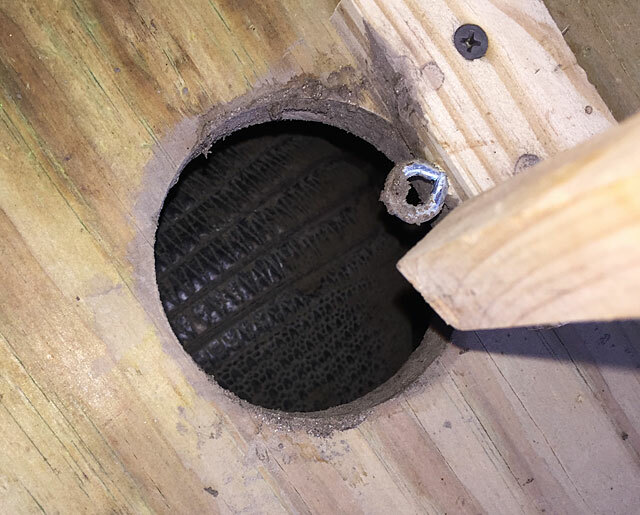 I was less apprehensive about the release process this time, but I might not have been had I been able to see inside the trap while I prepared to open the door. As the video below shows, the skunk's tail lifted ominously at one point, the equivalent of cocking the hammer on a revolver. I was a bit fascinated by the absence of any visible reaction by the skunk to the trap door springing shut. It's a fairly violent action, jarring the whole contraption and making a rather loud noise, but the animal was so focused on getting to the sardines I had placed beneath the bars of the cage that it didn't notice. That's probably why gluttony is one of the Seven Deadly Sins. By the way, much of the following video is sped up 400% for those of you with short attention spans. I move that fast in real life only on special occasions...like when a skunk is in the vicinity. I think it's time to give the trapping a rest while I contemplate a different, non-skunk-friendly bait that will still be attractive to raccoons. 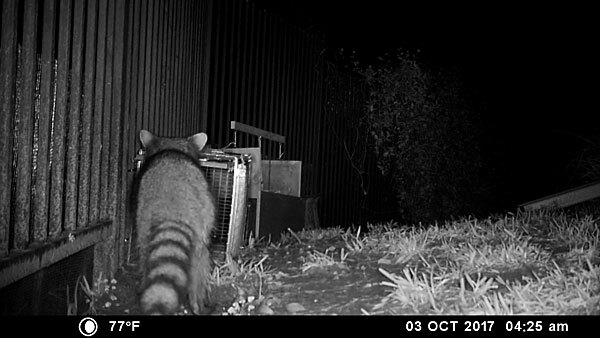 I know raccoons like cat food, but so do cats, and I'm not interested in trapping them, either. Skunk Works, or -- "Do you smell what I smell?" Uh...notice anything different about the scorecard, other than the increased population? 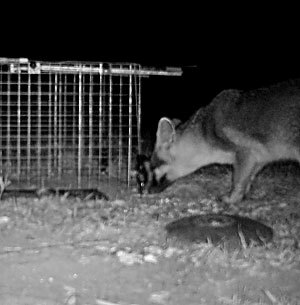 I've been routinely telling folks that I wasn't worried about catching a skunk, because they seemed to be disinterested in the sardines I put out as bait for raccoons (possums and cats are also attracted, unfortunately). 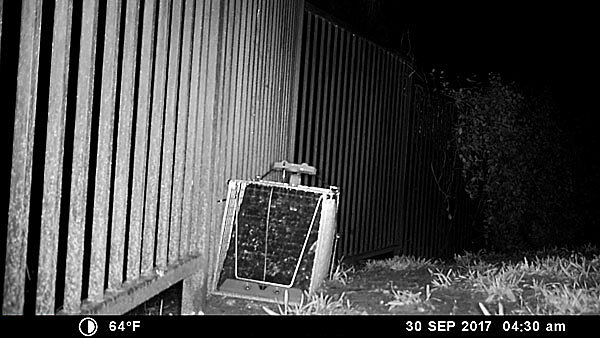 I had plenty of game camera footage showing skunks walking by the baited trap without giving it a second glance, and if they did happen to sniff around it, they didn't spend much time there. I was pretty confident in my animal behavior conclusions. That confidence was blown out of the water this morning about 7:30 when I opened the garage door and was confronted by a fine specimen of Mephitis mephitis, aka the ever-popular striped skunk. Well, dang. What now? MLB and I had actually discussed this scenario, back when we thought it might actually happen (or, before I was sure it would NEVER HAPPEN). Our thinking was that we would just call Animal Services and let them deal with it. That was probably still the smart play, but I've never been accused of doing the smart thing, and I decided it was my problem to deal with. While MLB googled tips on releasing trapped skunks ("talk in gentle tones to them," "crouch down so as not to be so threatening," "speak with a French accent, ala Pepe Le Pew." I might have made that last one up, but it seemed to be as valid as the other stuff. ), I added a shot of bourbon to my coffee to still my nerves. OK, JK. I actually busied myself by videoing the little guy, and mentally working up a strategy that wasn't completely boneheaded. We agreed that the best approach would be to sneak up on the trap, lay a blanket or beach towel over it (in the hopes that the skunk would be narcoleptic and instantly fall sound asleep), and then TRY to gently open the trap, followed by running and screaming but hopefully no stinking. The biggest concern was that the trap's door was by design very difficult to open. It was made so that it couldn't be opened from the inside (although alert Gazette readers will recall that one rough-and-tumble raccoon managed to thwart that feature). This meant that the force necessary to open it from the outside would bounce around the contents of the trap, and that had uncomfortable implications. 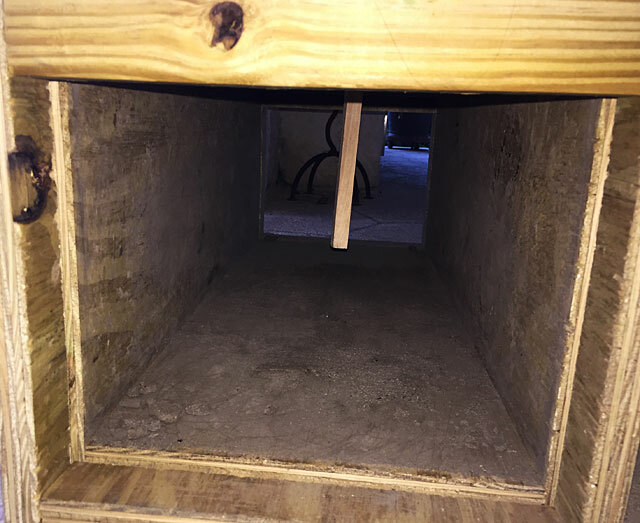 In addition, the blanket or towel covering the cage would defeat the mechanism for locking the trap door in the open position...meaning that I would have to stand over the cage, holding the door open, until the skunk vacated the premises. What were the odds that it wouldn't notice a 6' tall doofus hovering over it? Despite these challenges, I was determined either to be a shining example or a cautionary tale, and we proceeded as though we had good sense. I also decided that it was important to record the events for posterity, I think the following video speaks for itself. As you saw, the plan actually and amazingly worked. The little skunk - they're really cute, by the way, when they're not ruining your life - was no worse for wear and lived to stink another day. The same could be said for me. I will have to rethink my choice of baits, although I no longer have a clue about what attracts raccoons that doesn't entice skunks. Perhaps I'll just depend on the fact that skunks are so smart that one would never be trapped like that again. After all, I have such a firm grasp on animal behavior. What could possibly go wrong? I'm not a parent so I can only guess at the accuracy of what I'm about to say. I suspect that at some point in every child's life, they realize that most of those dire parental threats ("If you don't behave, Santa isn't coming." "Your face is going to freeze like that!") are idle, and not only are they no longer intimidated, they will downright flaunt the prohibited behavior, daring retribution. This is a compilation of scenes from my game camera taken over the course of a single night (Sunday night/Monday morning). How many species can you identify? To compound the insults, you might notice that two of the inorganic, inanimate objects in this little farce are traps intended to imprison at least two of these critters. Neither accomplished its purpose. A half hour prior to the raccoon's appearance documented above, it (or someone impersonating it) decided to take a closer look at the trap I had baited in anticipation of just such an inquiry. We already know the outcome, don't we? What we don't yet know is just how impudent and contumelious this creature's behavior will be. Do you see that? DO YOU SEE THAT? 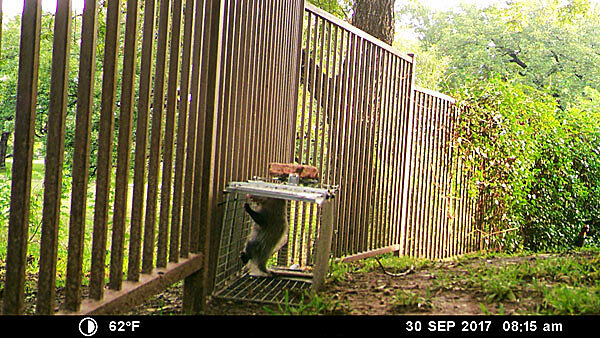 It's IN THE TRAP, dining on sardines, and mooning my game camera. *Rodney Dangerfield voice* I tell you, I get no respect. Update: Just when I thought things couldn't get any weirder...this happened this morning. The buzzard knew something smelled deliciously dead (five-day-old-sardines remnants), but darned if he could figure out how to get to it. Well, I may not be able to outsmart a raccoon, but that doesn't mean I'm a total trapping failure. 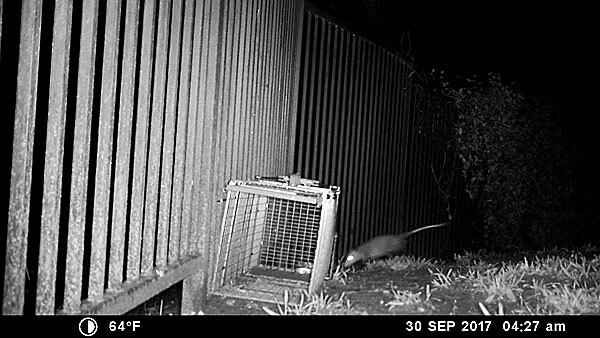 Later, I reviewed the photos from my game camera, which I had focused on the trap, and was able to recreate the timeline of the capture. The possum first appears at 4:27 a.m. Note the open trap door. The trap door closes sometime between 4:27 & 4:30, presumably to the possum's chagrin. Daylight arrives, but the possum doesn't depart, despite the open door. the prisoner decides to accept the terms of his parole. Alert Gazette readers will recall that this was not my first possum encounter. I much prefer the live ones to those of the deceased persuasion. They're actually a fascinating species, being almost totally resistant to the venom of rattlesnakes and water mocassins (which ruled out one of my cause-of-death theories espoused in the preceding link), and quite resistant to rabies. Also, that "playing possum" deal is a real thing, but it appears to be an involuntary, uncontrollable act, much like Trump's tweets. The catatonic state can last up to several hours. This behavior is not present in babies, nor well-developed in juveniles, which might explain why this young one merely clung to the side of the cage when approached. I'm fairly confident that possums aren't culprits in the systematic destruction of our yard and flower beds, so I had no qualms about releasing this one back into the neighborhood. Alert Gazette readers will recall that I was feeling pretty triumphant after the capture of not one, but two marauding raccoons who had been brutalizing our lawn. I'll admit that I was sure the human race could be proud of the way I was representing it in the mammalian biped-vs-quadruped battle. They will penalize your complacency. Yesterday I awoke to find a third trapped raccoon in the back yard. But while the other two had appeared resigned to their fate, this one was the Steve McQueen of raccoons (Not old enough to get the reference? Grow up and get some culture, wouldja?). It was trapped, but not cowed, and our lawn had paid the price. Sometime during its incarceration, the creature had managed to turn the cage over and frantically dug up twice the area of lawn in an attempt to escape (once while the trap was upright, and again after it was capsized). It was still jumping around when I went out to check on it, so I moved the trap over to a bare spot so it couldn't do anymore damage while I went back inside to finish my coffee. But when I got ready to load it up for transport to the release area...the trap was empty. It had somehow banged around enough to hit the trap door in just the right spot to open it. Let's recap. One, our lawn was damaged twice as much as usual. Two, the raccoon escaped. Three, he ate all the sardines. And not only did I still have a raccoon on the loose, I was sure he would never again be tricked into going into the cage, regardless of the lure of more sardines. They will capitalize on your mistakes. The lesson was hard, but I thought I learned it well. I would not place the cage in an area where the captive could do additional damage to the lawn, nor would I allow the cage to be rolled around by an over-stimulated occupant. I placed the cage next to the wrought iron fence, in a spot where the grass hadn't spread, so it was resting on bare dirt. In a stroke of genius, I used nylon zip ties to firmly attach it to the bars of the fence, ensuring that it would not be shifted, regardless of the enthusiasm of the prisoner. I then slid a fresh can (partly opened, of course) of sardines into the trap and armed it. I awoke the next morning to find an empty cage containing an empty can of sardines. Well, #$^$#$%. As it turned out, I had a good idea, but it was poorly executed. Allow me to rationalize explain. I'm using a Havahart® Easy Set® trap, which is an excellent design when not thwarted by an idiot owner. The design is pretty straightforward: the animal, lured into the cage by the promise of a gourmet meal, steps on a flat plate which releases a rod which in turn allows the door to drop behind the unsuspecting diner and said door [theoretically] locks in place, engendering feelings of deep regret on the part of the trapped animal. However, a problem occurs when some fool fastens the cage so tightly against something -- say, theoretically, the bars of a wrought iron fence -- that the door-dropping mechanism is placed in a bind so that the door drop, which is a fairly critical step in the whole trapping-the-raccoon plan, fails to materialize. Let's recap. One, the raccoon got a free meal, without the usual stress of a human leering at it through the bars of the cage. Two...well, that pretty much sums it up. The upside was that (1) the lawn was not subject to further humiliation, and (b) possibly that particular raccoon might view the trap as a variation on a Furr's Cafeteria and will return for another free meal. More lessons learned. I have now repositioned the trap -- loosened the bonds so that it's still tied to the fence, but not in a bind -- and rearmed it with a fresh can of sardines. And now we wait. Note: For reasons to be revealed later, you didn't see this post. In fact, once you're finished here, please extract your memory and destroy it, Mission Impossible-style. Thanks for your cooperation. Note 2: I conceived the title for this post when I briefly woke in the middle of the night, one of the few times I remembered an idea the next morning. When I told MLB that I had an idea for the title - thinking she would be amazed by my awesome creativity - she immediately said "Armadillo by Morning?" See what I have to deal with? Armadillos have become the bane of my existence. Our initial reaction to their presence in our back yard was "aww...how Texan and cute are they?" has given way to "would the neighbors really complain about the use of one tiny tactical nuclear weapon?" The damage they're doing to our lawn does have the appearance of a heavy shelling, as evidenced below. This is only one of about twenty such divots these animals are creating during their nocturnal searches for worms and grubs. Disclaimer: I don't actually bear any animosity toward armadillos. They are, of course, the unofficial state mammal of Texas, and I'm as illogically fond of them as the next Texan. They can't help doing what they do, just like some politicians. If you've never encountered an armadillo, here's a somewhat winsome overview courtesy of the Texas Parks and Wildlife Department. I'm not the only resident of Horseshoe Bay with this problem, and a tip from another victim led me to the online home of The Armadillo Trap, which is the name of both the creator and the creation. Based on the enthusiastic recommendation of the aforementioned tipster, I quickly parted ways with $94.95 plus S&T for the scented version, which is touted as being far superior to the unscented alternative. Here's what the trap looks like, after some minor assemblage. 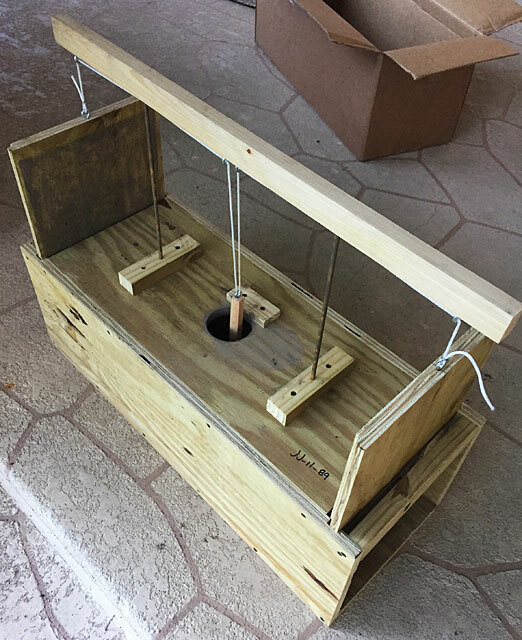 The stick dangling on a string in the hole in the top of the trap is the trigger. It extends into the body of the trap and when the animal contacts it, it pops loose, dropping the two end pieces and forming an inescapable trap. This is a view of the inside of the trap, showing the trigger described above. Incidentally, I don't know how they managed to impregnate the interior with armadillo scent, or even how they came to possess armadillo scent, and I don't want to know. (A certain scene from The Lost World: Jurassic Park comes to mind.) What I do know is that it's a vaguely nasty odor, unless you're an armadillo, then it's apparently Chanel No. 5. The instructions said to place the trap in an "obscure and shaded area." I dutifully ignored those instructions and put it where we've seen armadillos partying, as shown below. (If this spot looks familiar, it's also the location of the infamous Dead Possum Raking Incident of 2017.) I figured if armadillos navigate by scent, and if the trap's scent is alluring as they claim, any place in the back yard will work. Having set the trap, we retired to our slumber, nervous as kids on Christmas Eve. Would we wake to goodies or coal in our stockings? Would there be mourning or dancing? Would I ever give up on finding a decent metaphor? Here's the list of animals we've seen in or around our yard: raccoons, possums, foxes, deer, squirrels, skunks, snakes. I'm pretty sure we couldn't trap a deer in that box, but all of the others were somewhere on a trendline ranging from possible to doubtful. I wasn't about to open the trap until I knew what was inside. Fortunately, the hole in the top of the trap permits a quick peek at its contents, and this was definitely the shell of a nine-banded armadillo. What I did not want to do is burden another neighbor with my armadillo deportations, so I picked an obscure (there's that term again) and undeveloped area and performed the second part of the "catch and release" program, as shown below in the professionally filmed sequence courtesy of MLB. It took a bit of coaxing to dislodge the animal. Armadillos sleep 18+ hours each day, and they apparently can drop into a deep sleep anywhere. But as you saw, once the alarm goes off, so do they. I trust that this specimen has found its new environs to its liking, but the important thing is that it never shows its grubbing little snout in our yard again. Update: The next night, we trapped another 'dillo. Unfortunately, another one that was rooting around in the grass eluded my [very tentative] attempts to catch it by hand. I'll see you tonight, amigo! This page is an archive of recent entries in the Wildlife - Trapping category. Wildlife - Snakes is the previous category. Wildlife - Turtles & Lizards is the next category.